This artistically gifted woman is a consumer at DSC. She enjoys coming to and working at DSC. One of Melanie’s favorite activities is to paint. 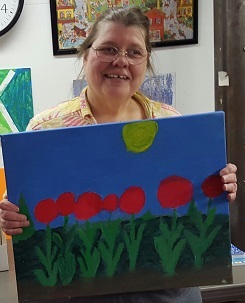 She has sold many of her paintings in the past and has even sold one to a former mayor of Champaign! Melanie likes to depict nature scenes and animals in her artwork. She says she often starts painting, unsure of what she would like to paint and lets inspiration guide her as she goes. Melanie paints to relax and de-stress from her everyday life. Melanie will be selling her paintings at the upcoming Roger Ebert's Film Festival 2016 at The Virginia Theatre in downtown Champaign! Melanie will be selling her paintings outside the entrance of the theatre this Saturday, April 16th. Come see and purchase some of Melanie’s beautiful artwork!